Livechat4website.com is a professional and easy to use live chat software, which provides best solution for real-time online interaction with your operators and website visitors. It is endow with safe, simple, fast, efficient online chat soluition capable for live help, live chat in real time, visitor tracking and proactive chat invitations for your products and services. Realtime chat - Easily interact with your website visitor by real time chat. 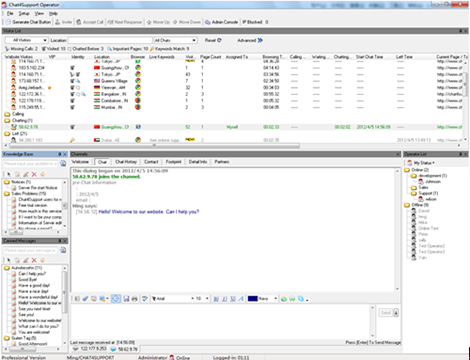 Chat between operators - Website support operators can interact with each other during live chat interaction with visitors. Manage multiple chat interaction - Allow multiple chat operators to live chat with multiple visitors simultaneously in real time. View chat history - Provide "chat history" tab that shows all your chatting history details including the chat time and date. Canned Response - An operator has facility of sending Canned Responses, which are predetermined messages for common questions to quickly assist their visitors. Offline messaging - Website visitors can send offline messages when website support operator availability status is shown offline. Visitor information - Shows each and every website visitor information including location, IP address, language, Browser, keyword usage etc. Block selected IP address of visitor - Operator can easily block IP address of selected website visitors. Email chat transcripts - Provide the facility of sending live chat sessions to visitors on their specified email address for future reference. Using on the website gives your visitors great comfort in solving their queries in real time. It is suitable for small to large size organizations that allows web site visitors or online customers to connect with company representatives and have their queries answered instantly. Download software from the website to check the working features and functionalities. If satisfied then purchase cheap instant chat software at an affordable price. Having live chat software will increase conversations for your internet business, this allows customers who are having problems to immediately be able to solve those problems instead of leaveing your website completely.Our live chat software gives you full control. What ever the reasons for addling live chat to your website, this powerful, reliable solution will satisfy both you and your visitors. It is the best software to create live support chat on your website! Chat4Support is one leading online communication tool that can help you add live support chat to your website and achieve your sales goals. Wether you own a small business or a large one, we promise to provide you with a creative and efficient Live Chat Service. As a webmaster, it is vitally important to monitor your website traffic. You must know where your visitors come from, what web pages they are viewing and how long they stayed. By this way, you can easily understand what your potential customers want and figure out how to meet their needs. Chat4Support is a live support chat software with website monitoring feature, which lets you analyze visitor tracking and improve online maketing performance. It combines the features of live chat support and website traffic monitoring, which allows put the free live support chat script to your website gives you a chance to find more potiential customers and greatly increase sales and website revenue. Let try Chat4Support - Best Software to Create Live Support Chat on Your Website and Increase your sales and conversions as much as possible. With Chat4Support from http://www.livechat4website.com , you can increase your website presence by live chat technology and gain proactive leads. The chat widget software allows companies to communicate live with visitors coming to your website. Chat4Support is a powerful free chat widget software and customer service for your website that enables visitors to instantaneously communicate with your personnels.Visitors to your web site simply click a Live Chat Online button and are connected with one of your representatives. Your representative then assists the visitor by providing information, links, graphics, or even guiding them through your web site. Our Live Support solution instills a higher level of confidence in your customers which results in increased sales volumes. Monitor visitors on your website in real time. Setting up your website chat widget is simply a matter of registering for an free account, then add your chat button codes to your site. You are then ready to start chatting live with your website visitors right away. You can try out many of the website widget features for yourself in our 5-day free trial! Taking into account all aforementioned benefits, Chat4Support is the best free Website Widget Sodtware that you can get for free trial and install free chat on website. Its free package is more than enough to provide you reliable live chat and visitor tracking solution. If you want to set up live chat for website, monitor website visitors and analyze their web activities, you'd better try Chat4Support! Like best free website chat widgets? Chat4Support can fully meet your needs! Go to download from http://livechat4website.com/Download.html and have a free trial experiece. How to add chat box to my website? Using Chat4Support is a simpy way you can provide live chat to your customers without spending too much time and money. It also provides you with free live website monitoring feature, which can monitor website traffic, and analyze visitors' web activities, including their search engines and keyword usage. How to add instant chat to my website? Follow these step by step instructions to add live chat to your website free. Download Chat4Support software client from Download page. Install the software(Run Chat4Support.exe file you have downloaded). Sign up a new account by clicking "Sign up a new account" in software or sign up on the Chat4Support hompage. Run Chat4Support software application, and login as a new user. Generate new chat button HTML codes from Chat4Support Operator software-->-Setup-->-Generate Chat Button HTML Codes. Paste the chat button HTML codes into your web pages where you want to show up a chat button. Now you're able to provide an easy way for your website visitors to chat with you while you are online. There are obvious reasons to use live chat softwares: customers have become more demanding and don't want to wait days, or even hours, for an answer. Various studies show that not only will initial purchases will pick up, but also customer loyalty will improve. The time is right to try live chat support on your website. There is a great number of very good providers that offer easy live chat solutions at very affordable price rates. And setting them up on your website literally only takes minutes. Using Chat4Support - an easy click to chat software, free chat service for website is just a click away. Chat4Support is a customer service tool for your website that enables visitors to instantly receive live help from your personnels. Visitors to your web site simply click a online chat button and then enter a live chat with your representative. With the following key features, will Chat4Support attract your interest? Above anything else, our customers love how easy Chat4Support is to use. Easy to set up, easy to customize, and easy to chat with. Chat4Support is also powerful, flexible and fun, and compatible with all major browsers! Do you want to add chat to your website? Do you wish to create websites with onlines chat features and visitor tracking features? Are you thinking about setting up an online community? With Chat4Support live chat software, all of this is possible! If you want a free program to create chat for website download, do not hesitate to download Chat4Support and enjoy your free trial experience! If you are running e-commerce business,it is no more better than adding live chat button to your website and Chat4Support can help you.Why?Chat4Support is an easy,profitable and effective software which lets you live chat with your customers and visitors .Just click on the chat button,real time livechat can be implemented. Free Trial Download of Chat4Support! There is no other complicated steps, even though a green-hand computer user can operate this software well.As an operator,he/she merely login the application and real time live chat and live support can be done. Compared with other online chat softwares,Chat4Support asks for lower price .You only have to pay little charges on Chat4support,you can chat online for websites easily.It lets you proactive chat with your customers and visitors .Without waiting for new comers for chatting,you can invite some visitors to ask whether they would like to purchase the product or there are some doubts they want to confirm.Some operators worry about missing a call when they are out of office.To tell you the truth,it will result in decreasing the satisfactory of custom service if he/she keeps missing calls.However,Chat4Support allows you set auto-invite chatting.Besides,there is a ticket system that your visitors and customers can leave messages to operators.Under the features,you can know more about the situation of your company by feedback and suggestions from your customers and visitors.It follows that ,live chat and live support on web is crucial to internet transaction. It is reported that online chat application benefits sales of e-commerce by authoritative statistics.With Chat4Support,your sales volume will go up quickly.Unlike other types of software,Chat4Support offer multiple features .The first advantage of Chat4Support is that it can help you save time.As an old saying goes:Save time equals save money.How?Instead of picking up phones,operators can live chat and give instant live support to visitors and customers .After using Chat4Support,companies can save the charge of communication.Second,a good service will bring good image to visitors.A good image and public praise is better than taking ads .As you know,putting ads on websites takes you much money while adding live chat for your websites can save much cost. How to integrate live chat button to website? 1. Click on the button called "Set Up". 3. In the window called "Generate Chat Button HTML..." , click the "Copy to Clipboard" button, then the provided chat button HTML is copied to the clipboard "Chat Button HTML" that is on the left side of the "Copy to Clipboard" button. This is just copied once. If you try again, there is no need to copy to clipboard any longer. 5. Choose the style, sample, and picture you prefer to display the chat button in the web page. If you want a free live chat support with monitoring solution, Chat4Support can be your best choice! Do not hesitate to download the free web chat for your website and have a free trial experice. From now on, you will improve your sales and stay in better touch with website customers or visitors. Do you want a free live chat for website visitors? What is the best way to embed live chat on website? Choose Chat4Support - a Free Live Chat Software and Visitor Tracking Solution for your website visitors. It provides you with live chat features and valuable visitor insights which can ultimately empower you to chat online with website visitors convert and turn them into loyal customers. Interact with your visitors like never before; chat live with them, assist with queries, resolve their doubts, pitch your products and push your business beyond limits. The free live chat is now available with free trial version which is very helpful to evaluate its full- featured performance. This free trial version can be successfully used for a period of 5 days from the date of account creation. It is very easy to use to offer online customer support, as easy to use as any email application by free live customer service chat and free live customer service help. No software or hardware is required by your customers. You just need to download it and integrate the chat codes with your website flawlessly and start live chatting quickly with your website visitors. Customers just only need to click the chat button to chat with operators and get online support in real time!The interactive web chat tool will help to accumulate your customer service experience. Learn how to make every experience a good one for your brand and your budget. Download and try Chat4Support free for free! Our free support chat for website instills a higher level of confidence in your customers which results in increased sales volumes. you can chat live with visitors on your website on a 1-to-1 basis. Address their queries and assist them in completing the sales process both quickly and conveniently. Live chat softwares are now an integral part of any business websites. Livechat communication tools enable you to take a more customer-centered approach along with efficient online support. Customers want to get quick confirmation of any troubles they are facing, a live support chat plays a key role in such case. Now Chat4Support can fulfill such needs successfully. It can help you very much in improving customer help support which could further result to large customer traffic for your online business. Promote your business by providing instant live chat support to your website visitors. Provides multiple chat sessions with easy file transfer facility. Offline messaging facility to send/receive messages during offline mode. Empowered by SSL security feature to protect sensitive information. Provides centralized control and easy integration with websites. Customizable chat button available to perform an effective live chatting with co-browsing. Allows a real time visitor monitoring along with geographic region, browser type, and operating system, etc. Options of administrative controls available to block IPs of some vicious visitors. An effective website traffic monitoring with visitor statistics and other details. Other beneficial features like chat history, screen capture, multi operator chat, typing indicator, spell checker, transfer chat, keyword match, chat survey, operator robot, helps to perform a faultless live chatting with customers. ......>> Read feature details here. If you are looking for a free live chat for website visitors, why not choose Chat4Support? It is easy to set up, flexible, secure and reliable! Don't risk the success of your live events. Trust Chat4Support to help you reach more customers and grow your market! Easy and free,if visitors or customers have any questions or doubts, just simply click the chat button on the website,operaters will give them instant help throughout livechat window.A great amount of statistics demonstrated that,live chat for website is a good helper for online business since under live chat scripts ,the sales and reputation go up in a fast way. By chatting online, potential customers can be found.Why?In today's business strategy,it is no longer to wait for new order so initiative become more and more significant.Chat4Support offer a function that lets operaters to catch potential customers by proactively invite visitors to chat online.Instead of hesitating,operators can greet to visitors and ask whether they are willing to purchase . In addition to live chat for website,monitor and analyse visitors' footprint is also important.Chat4Support can let you know where the visitor come from,whether he/she has ever talked to your operators,how many times they had browsed your websites and which keywords they had searched,etc.This kind of function can help you make a better strategy and well-focus your products. Different from traditional media tool like phones ,it is costly for company to make a phone-call to another country with customers .Therefore,live chat and live support on website can save lots of money of communication.Visitors and customers can get real-time and instant live help from the websites that they do not have to pick up the phone when they are busy.It is totally free and convenient! There is a tool bar contains canned message and knowledge base ,operators just need to double click the pre-set messages and it can be automatically sent to visitors.By this function, it is available for improving service quality and customer satisfaction. How to intergrate Chat4Support on your websites? Do not miss this outstanding livechat script !Free trial full functionality! You may find more and more people prefer to use online chat software to their websites. Chat4support,is one of the best live chat software for website,which offers multiple features to companies.Chatting with your visitors and customers,monitoring visitors' footprint and keyword matching,etc. Is it expensive or low-cost? How can I know whether it is effective? How to add live chat button to website? Is there any requirements to integrate live chat software? Customer engagement is essential to your sales and customer service. Chat4support is live support software as well as a sales support program. By handling customer support inquiries and questions about purchasing your products, Chat4support will help you increase sales revenue and improve your customer service quality .The traditional customer service,is no longer satisfied modern sales.Without waiting for visitors calling,you can pro-active chat with them. Chat4support allows you auto-invite any visitors and customers for chatting on websites.People like passionate sales because they know more about what they really need and give the best service to them .Using Chat4support,it will help you keep customers happy and come to purchase your products again. Except for live chat ,Chat4support is also a tool to give instant live help on website,which is more effective than other programs.Customers in all files are increasingly becoming more demanding, requiring instant satisfaction at a superior service level. Sometimes your customers or visitors are very busy,so that they are not willing to pick up phone for consulting .Chat4support plays an important role in live support,that offers live help for websites and is the best live chat software in the market to help augment your customer support software with real-time engagement in a low-cost and effective manner. With online chat software,you can communicate with customers much easier.I think you had ever asked how online chat service on your website affect online sales or conversions? Live chat for your website allows you to do just that, provide live customers engagement on your website,.A combination of proactive chat and click-to-chat features from Chat4support offers a flexible and beneficial online experience. Studies have shown that users are more likely to purchase online products when they are able to engage live chat or live help to place questions just before the sale. ----Visitor Traffic Monitoring:You can view which webpage they are browsing ,how many times they had entered the page. ---Visitor's Activities Status:You can upload customized chat buttons or create your own design and use them for both online and offline buttons. ----Auto-Invitation:Pro-active chat with customers,which represent you are more hospitable. ----Free and Automatic Upgrade:You can upgrade the software into the latest version. How to implement live chat program to your website? How to generate chat button? It's never been easier to chat with the visitors for your website. Just choose one of the best solution to help you ----Chat4support.Your visitors just need to click the chat window ,you can engage with them immediately.So,why not download and try it right now? Additionally you can customize the logo of the chat button and choose which is the best style of yourself .In order to fit your requiement,Chat4support will make great effects on live chat technology. Finally, just go to the download page to have an amazing journey. If you are running e-commerce on the internet,you may see each website has its live chat button. Chat4support is one of the advanced chat script ,which performs excellent functions .It allows you to live chat with website visitors and customers ,plus,it enables you to give instant live help to the visitors as well. What can Chat4support do for you? Unlike other online chat software,they just provide livechat and live help,but Chat4support lets you track visitors' footprint so that you can view the detail information about your visitors.The information includes IP address,location ,VIP visitors.Also,you can see how many times they had ever entered your websites and which webpage they are viewing.This real-time tracking function satisfied more and more customers ,they both like this attractive feature because they can set-up a compelling business strategy about the commerce. so that you do not have to worry that visitor will get angry when the call is ringing . When the operators are offline or in busy status, the visitors can choose the Robot Knowledge to answer their questions. The visitor only need to type the question with the keyword in the input box. Then the robot operator will provide the corresponding answers for them to choose.Under this function,the service quality can be improved into a higher level . Nowadays,more and more hacker rise ,thus ,our chat history must be protect When you use SSL (Secure Sockets Layer), your conversation with visitors can be encrypted so no one can intercept your critical dialog. Whenever what kind of business you are running or no matter what products you are selling ,Chat4support can meet all your needs .The feedback of Chat4support users had reported us that this software is quite useful when they put the products on line.They can easily contact their customers and attract more customers.One of them like the visitor identify most because she could distinguish who she had talked before and which is the VIP client.They no longer wait for new customers but pro-active chatting with the new visitors.They introduce the product,the price,the comparison about the similar products,etc.Also,they just need one or two operators .Why?One operator can contact with several customers but they will not feel difficult to do that.If they just hanging up the phones,they could not server multiple customers at the same time.But with Chat4support,they can easily have a conversation . Chat4support provides free trial use for 5 days, which has full professional features.After 5 days, it will turn to the free version automatically, which can be used for 30 days.Please go ahead to download the software to have a free trial experience.Plus,there are several version to let you choose (Lite Version,Standard Version and Professional Version).Different version has different functions,so you can choose the best version to fit your needs. In today's speedy society,everyone is a busy man.Sometimes visitors and customers may have some doubts and problems they want to ask.Giving instant live support to them will be very helpful.Some of them may ask the price,the quantity,ways to pay or something else.Also,live support can satisfied visitors and they may give better feedback to your websites. As to the live chat,it is a very popular methods to communicate with clients.More and more people choose this kind of open source software to keep in touch with customers.Instead of email communication,they prefer live chat software. Creating an open source software on website,you can live chat and give instant live support to your visitors and clients .You only need to spend little money on live chat program,it is much lower than online advertise and other promotion methods.Customers and visitors just click on the chat tab,they can contact your operators easily and receive high quality help.Under this situation,you can save lots of budget on ads and focus on custom service. 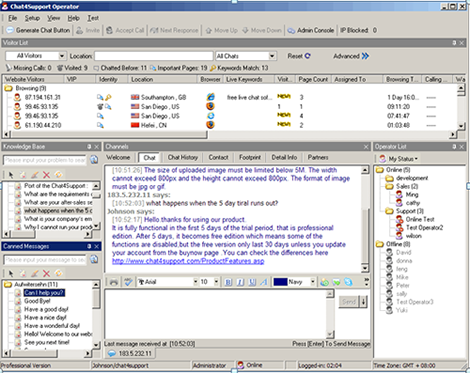 Unlike other live chat widgets ,Chat4support allows you to send messages in a fast way.There is a canned message box in the side of the chat window.Your operators only need to double click the message they want ,they can greet the visitors and they can easily send the answers to others.Sometimes there are so many visitors and customers call them at the same time,so they may be very busy and may confuse which one they are talking to .The knowledge base ,which provides pre-set FAQ,they can answer the questions more quickly and accurately.Here,you do not have to hire much more operators,maybe one or two is able to handle all the calls. With the professional features of Chat4support,you can see the visitors' footprint and more detail messages of them.For instants,you can view what keywords they searched by Google ,Yahoo,Bing,etc.Plus,there will be a chat history if they had ever talked with your operators. With these useful information,you can know what to talk and how to greet them in a better way.This can be a very powerful methods to satisfied your customers. When a visitor comes to your website more than once or browses an important page,you can distinguish the visitor at the first time.Also,you can identify VIP visitors from your visitors' list and who had chatted with you before. You can capture any screens and transfer them to whom you are chatting with. You may doubt that is it valuable for me to use it?Does the sales revenue will be increase?How to use this kind of software?The truth is that using Chat4support will be a good choice for you.How? How to add a chat box to my website? Are you eager to embed live chat support for your website? Adding a web chat software to website is a rather broad topic today. There are many chat softwares out there, but some of which are too expensive, some of which are not easy to use. One of the best free web site chat programs is Chat4Support! Chat4Support is a free web chat software for visitors tracking and live chat, help and support. Livechat support help brings more confidence to your customers. This free live chat support tool can help you sell your products on line and supply realtime support and customer services by live chatting with your customers or visitors online. Chat live with your customers or visitors on your web site to solve their inquiries and assist them in completing sales process. Chat4Support helps in closing sales faster. The easy to use website chat tool also comes with visitor tracking features, which allows you to monitor website visitors, track visitor footprints, analyze visitors' activities and status, as well as collect visitor information including their geo-location, referrers and search keywords. With Chat4Support, you can easily track website visitors, analyze website traffic and identify which visitors are the most valuable, then invite them to chat in real time. Other features of Chat4Support includes Proactive Chat, Chat History, Skype Chat, Support Ticket System, Knowledge base, SSL, File Transfer, etc. Read more features of Chat4Support here. Chat4Support supports all Windows platforms and you can even chat with customers using smart monile phones! Where are downloads to set up live chat to website? Download here and get started for free! How the web chat software benefit you? Potential customers will usually have questions. If you can offer live chat help to answer their questions instantly, they're far more likely to stick around and make a purchase. Live Chat is a live help software. Questions are answered immediately and online, limiting or eliminating the need of a toll-free number. Your staff can chat online with one customer while they're on the phone with another customer. It's a fact - customers respond favorably to the opportunity to have a live chat with real people who can answer their questions directly and instantly without being placed on hold or waiting for someone to get back to them. Do you want to chat with customers on your website? Are you seeking a free live chat support software for your website? Where can I find a free web chat software? Try Chat4Support immediately, and you will find it useful to improve your online sales, win your customers' confidence and trust. It is the best free web chat software we highly recommended! In short, no loss of business or time! 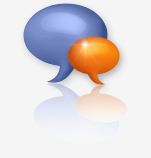 Try our Chat4Support web chat solution for your website free today! You will not be disappointed. Are you going to add chat now to your website? Try Chat4Support, which can empower you live chat with website visitors, monitor site traffic, and analyze visitors' web activities, including their search engines and keyword usage. Chat4Support is a php free support chat app that enables you to reach and engage your visitors in real time. It is one of the most complete, beautiful and easy to use chatting programs that will turn your website into a full-fledged social networking site. Chat live with your website visitors, in real time, from your own web pages! Our fun and powerful Free Chat Software for websites gives you the power to quickly create a live chat website of your own. Chat4Support is also a asp.net live support chat software with monitoring feature, which can make you analyze visitor tracking and improve online marketing performance. It combines the features of live chat support and website traffic monitoring, which gives you a chance to find more potential customers and greatly increase sales and website revenue. Setting up your website chatbox is simply a matter of registering for an account, then logining to the account and adding your chat button code to the webpages. You are then ready to start chatting live with your website visitors right away. You can try out many of the website widget features for yourself in our live chat software demo. It is super simple to setup and takes less than 5 minutes. Just click to download Chat4Support now! Chat4Support comes complete with all the features that you will ever need. Because we know that your success is about more than our software. Whether you're at the beginning of your search for a live chat software provider or if you're already very familiar with the options available, you are bound at some point to ask yourself a fundamental question: "What's the main difference between all these live chat utilies and how does that benefit my business?" Most livechat softwares are too complex. Too many features, too many buttons, too much confusion. Chat4Support solves this problem by giving you a low cost, easy to deploy online solution that can have you providing live chat support in minutes. Chat4Support tackles live help from an entirely different angle: A focus on simplicity, giving you only the features you need to provide outstanding customer service and close more sales. Chat4Support is an effective tool for increasing online e-commerce revenue. Answer incoming questions and proactively engage visitors in online chat — and get higher conversion rate! Chat4Support live chat is simple and effective solution that boosts income without increasing the ad budget. With Chat4Support you can chat with visitors on your web site to increase conversion and online sales! Four Ways Chat4Support is Different! * Convert More Visitors - Increase your sales by knowing your customer's unique information. * Software As A Service - Easily manage operators, departments, settings. On-demand live support. * Online Live Help - Respond to your visitors in real time. Engage customers, lower support costs. * Improved Efficiency - Faster, better. Let your visitors contact you and help answer their questions instantly. Can we start to chat now? 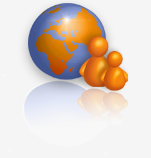 If you are looking for a free chat software for website, Chat4Support will be your top option! It is the best website chat software we highly recommed! Say goodbye to the old chatrooms, we offer a new and easy way to hold chat discussions on your site. Try out Chat4Support for yourself, and see how easy it is to add live chat to your website and help to improve your online sales! Download the software and try it now! Livechat for website is an effective and dependable way for your business transaction. Chat4Support is a powerful livechat software which has multiple benefits. Chat4Support is easy ,low cost and valuable. Add live chat to your websites as a communicate tool can help visitor know more about your products.Besides,live chatting can help keep in touch with visitors all the time.Your operators can ask visitors whether they need live help or not and answer their questions in real time.In addition,livechat for website can increase customers' satisfaction. Offering online chat for visitors instead of traditional mobile-phones or emails,it is a best way to reduce communication charages and save time to give better service to multiple visitors. Livechat for website can automatically invite potential customers to chat so it can improve your response time and make visitors feel at ease and more satisfied. Proactive livechat can turn visitors into customers and decrease who left without purchase.If you are looking for software for livechat,please feel free to try Chat4Support.With Chat4Support,you can monitor and track your visitors who had browsed your websites.Therefore,you can find whether the visitors have desire to purchase your product and make a better e-commerce strategy. Get started with livechat for webstie! Chat4Support is your best choice! Why Chat4Support Free Web Chat Software? As the internet evolves rapidly, it is shown that the majority of customers or visitors prefer immediate online helps rather than telephone or email helps. Chat4Support is a tool for live help and online help. Because your representatives do the business with your customers on your web site, your representatives can do everything efficiently, offering live help and online support instantly, which is certain to attract more customers or potential customers to do businesses with them. So, if you realize the effects of live help, you can find that your customers or potential customers are more than twice as likely to purchase your products and enjoy your services once they use live help and chat with your representatives. Chat4Support can let you afford live help to your customers or visitors. Your operators can use our product to connect with customers or visitors instantly with live help or click-call to close on-the-spot sales. Transactions between your company and your customers can be shortened by live help. Operators can only search for potential customers, invite them to chat, send product information to the customers and solve the problems aroused by the customers. They do not need to complete their businesses only by emails or phone calls. Using live help software is a more efficient method to do transactions. Live help can dramatically reduce the time more than by other means to communicate with your customers or visitors. Nobody is willing to waste time to wait for your emails or faxes to illustrate your products or services. Chat4Support software is one to supply live help that let you eliminate all the troubles mentioned above. Chat4Support software is run through internet. Offering live help means you do not need to use a phone call or fax to contact with your customers or visitors. You just only do everything on your web site to communicate with your customers or visitors and provide live help. That can dramatically reduce the costs of bills. Live help in Chat4Support allows you to quickly locate a customer support representative to help them with any questions and information regarding your products and services. Since our product is a tool for you to live help with your customers or visitors, you can offer instant and effective live help when you and your customers or visitors are on your web site. This is certain to make you easily provide your best customer services and enables you to attract more customers and potential customers to deal with you and increase your company's product and services revenue. By using our product can make you supply live help to your customers or visitors. Live help has the ability to increase your online revenue with higher sales rates and larger order sizes. You can sell your products on your web site instantly by chatting with your customers who are browsing your web site. Do not hesitate to download Chat4Support web chat software to have a free trial experience! Want to add live chat support to your website? You have good reasons to: live support enables you to talk to your visitors directly - just like a good old salesman in a retail store. More often than not, customers are hesitant to buy for trivial reasons. A short chat can resolve these issues very quickly. By actually talking to your customers you'll quickly find out what they really want which in turn allows you to greatly improve your website. Get Started now with our Chat4Support of the best live chat solutions out there! There are obvious reasons to use live support: customers have become more demanding and don't want to wait days, or even hours, for an answer. Various studies show that not only will initial purchases will pick up, but also customer loyalty will improve. The time is right to try live chat support on your website. There is a great number of very good providers that offer hosted live chat solutions at very affordable price rates. And setting them up on your website literally only takes minutes. Is Chat4Support the right Live Chat for MY website? What can Chat4Support do? Download and try Chat4Support for free and see how you can easily live chat with your website visitors. Chat4Support is an advanced live chat software solution suitable for all size websites, which will boost your sales and improve your customer service. It can dramatically increase sales by being there for your customers or website visitors at the very moment they have a question about your product or service. It's the best business live chat software that works when and where you need it. Why Set up Chat4Support for Your Online Business? * Chat4Support is a great way to help your website visitors quickly and easily. By installing the chat widget on your website you can talk to your visitors in real-time and offer best-in-class support to your customers. * Access the live chat console today for free! Simply sign up and login. You can be chatting to your visitors within minutes. See the live chat software for yourself and increase sales. Chat4Support is your best business live chat software for website. Add Live chat software FREE today to engage with your website visitors and increase sales and customer support! Live Chat with Users on Your Website! Chat4Support is a convenient and intuitive live chat software that enables your salesforce to contact customers directly on the website. This program gives your visitors the opportunity to chat with you in real time just by clickinga chat button from your site. Installing Chat4Support live chat software is a great way to have support on your website or to talk live to your visiors. Help online visitors find what they need before they leave your site, guide them through order process and start selling more thanks to live chat software! - Increase sales conversion rate and customer satisfaction level. - Allow customers to chat in real-time with the sales persion. - Increase the number of successful transactions. - Provide your customers with free, secure and reliable communication. Is this software free? How much is it? - It is fully functional in the first 5 days of the trial period, that is professional edition. After 5 days, it becomes free edition which means some of the functions are disabled. You can check the differences here . Live chat with users on your website! Try now! With Chat4Support, you can chat with visitors on your web site to increase conversion and online sales! Your software keeps asking me to upgrade to Ver2.8.9, I have done it 10 times and it keeps asking. What do I do? 1. Make sure you are running only ONE Chat4Support Operator Client. 2. The current Windows account user must be the same one, with which you installed Chat4Support Operator Client. 3. If Chat4Support is running on Vista, UAC in Vista must be disabled. If you wonder: " How do I set up a live chat and put it on my website?" Chat4Support can be your best choice! It is powerful but easy to use. It lets you to live chat with website visitors, monitor site traffic, and analyze visitors' web activities, including their search engine and keyword usage. Why do you need Chat4Support? Just as a sales representative in a store might approach a customer or visitor and offer assistance, Chat4Support live chat software allows your business to take the first step in initiating a proactive conversation with a potential client. Chat4Support efficiently gives your websites' visitors the chance to communicate with a live customer service representative in realtime. The problem with web advertising lies in its passivity: when a customer browses a website, he or she has no option to ask questions and get immediate answers. Many customers may have questions or inquiries about your particular products or service, but may not have the initiative or the time to pick up the phone. With Chat4Support live chat software, any questions the visitor might have can be answered on the spot, saving time and making it easier for the customer to make a decision about your services. Even if you already have a great website, a live, active customer service option can strongly enhance the appeal of your site and can lock in new clients immediately. If you want to attach online chat for website visitors, why not try Chat4Support? Adding Chat4Support to your website will do great helo for you. From now on, you can easily talk to your website visitors and convert them into customers and greatly improve your online business! * Hi there, I have upgraded to a paid account but when I go to upload my images, an error message came out and said uploaded unsuccessfully. Please can you look into this for me? Please check that the size of uploaded images must be limited below 5M. The width cannot exceed 800px and the height cannot exceed 800px. The format of image must be jpg or gif. * Why there is no any visitor browsing data in my visitor list? But I am sure there are visitors on my site and i am also browsing it as a visitor. Did I do something wrong? Please help! 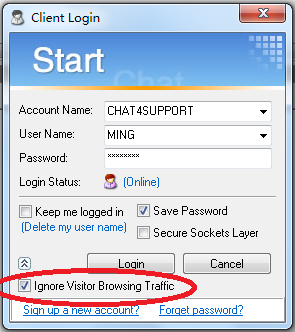 When you login to the software client, please check whether you have selected "Ignore Visitor Browsing Traffic" item. If yes, you cannot see any visitor browsing traffic from the visior list. To promote your software initiatively! Are you still waiting for visitors to get to know about your software? Why don’t you introduce your software initiatively? Please try our product – Chat4support0, and then you’ll have amazing experience! Our product has strong features. When a website visitor browses a webpage that exceeds a set time, Chat4support can send an invitation to the visitor automatically. To have proactive chat, it helps you to catch the opportunity to promote your product as a leading role in online business more sincerely and efficiently. Furthermore, you can review all chats with visitors, including successful and missing chats. There you can analyze all chats by different statistics, such as chat time, response time, operator logging-in date or chat history and so on. Please read the Online Manual on our site http://www.chat4support.com/ , which can help you install and start using this software. Chat4support, a reliable friend of you! While doing business with others, of course people will take security into consideration. Especially do business via internet, it can not ensure that whether your conversation and information are confidentiality. Chat4support has a better solution on this problem. Once the function of SSL (secure sockets layer) has been activates, you do not worry if anybody intrudes into the conversation between you and your visitors or clients any more, all the conversations can be encrypted so no one can intercept your critical dialog. Chat4support not only a tool for chatting with website visitors, but also is a reliable friend to make with. *I want to collect the website vistor tracking data. Is it possible to print the activity that i've monitored once i install this live chat software? Yes. You may go to the Admin Console (web)---Traffic Analysis--Website Visitors, and then you may export the activity data to HTML (browser) or Excel, and use the Browser or Excel 's Print funtion to print out the data. Chat4Support has strong features. It lets you to live chat with website visitors, monitor site traffic, and analyze visitors' web activities,including their search engine and keyword usage. We offer free trial use for 5 days, which has full professional features.After 5 days, it will turn to the free version automatically, which can be used for 30 days.Please go ahead to download the software to have a free trial experience. * How to SET UP Chat4Support? * Please view http://www.chat4support.com/EditionComparison.asp to see the differences between different editions. http://www.chat4support.com/Buynow.asp and you can also place a new order from this page. When you place the order, please select the edition and billing plan you would like to purchase.After we receive your order, we will activate your account accordingly.